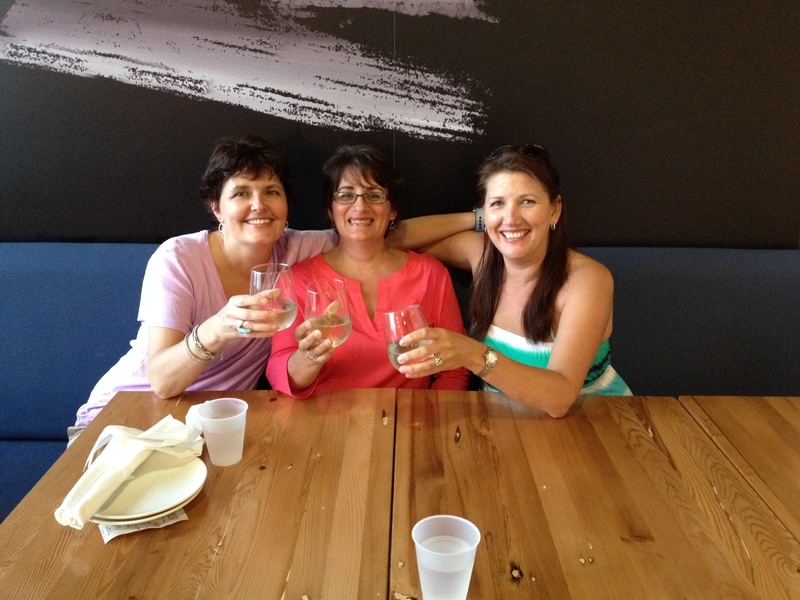 There aren’t many people in this world I’ve known for 30 years — my beloved hubby included — so when I meet up with them for a girls’ weekend, it’s worth a blog post. I met Michelle and Tyrone (she goes by “Ty”) in 1984. We were all working at Boutique Marie Claire, a women’s clothing chain some of you might remember. It’s still up and running in eastern Canada and Quebec but, going by their website, no longer has locations in the Toronto area. Michelle, Ty and I worked at the Sheppard Centre location, in Toronto’s north end. I was 19 at the time, going to Ryerson and living with my parents at Yonge and St. Clair. Tyrone had recently moved with her family from Sudbury to Toronto’s west end. Michelle, meanwhile, was a farm girl from Zurich, Ontario who had a boyfriend (now her husband) back home and took the train back most weekends to see him. We were a mixed bag, to say the least. And I don’t think any of us would have predicted our friendship would last through the relationships, relocation, challenges and change that life can throw at you over three decades. But there we were last weekend, ushering in summer together in London, Ontario in Ty’s exquisite little back patio, surrounded by flowers and warm June sun, sipping cold drinks and reminiscing. And there was no shortage of grist for the memory mill. We talked about old friends and boyfriends — one of whom, incidentally, Ty has recently reunited with and fallen in love with all over again. He was her high school sweetheart. (I have yet to meet Glenn but he sounds like a terrific guy and treats Ty like a queen — as she so deserves). We talked about odd people we used to know, like a former roommate of Michelle’s who had two names — and personalities and voices to go with them: there was “Randy”, the nasally-voiced dweeb who fussed and worried himself silly over everything, and there was the Sam Elliott-voiced manly man who answered the phone as “Wayne”, sounding like he could sell Dodge RAM trucks. What’s up with that, you ask? Michelle still doesn’t know. Though Randy/Wayne, if you’re reading this: thank you — you gave us a lot of laughs last weekend. We also talked a lot about Grand Bend — our long-ago summer haunt on Lake Huron, made particularly convenient by the fact that Michelle lived in Exeter (and still does), about 20 minutes away. Oh, the summer days and nights we spent cruising the beach and bars in the Bend with Michelle’s local, very friendly gang of friends. I remember sitting at crowded tables, sipping tall bottles of Blue Light (when it was new) and watching videos on MTV (it was new too). I remember Phil Collins (“Sussudio”), Gino Vanelli (“Black Cars”), and Wham (“Go Go”). I remember striped t-shirts, big hair, plastic bangles, and neon eye-shadow (which I believe, if I’m as hip to the jive as I think I am, has made a recent comeback). Ty and I would take the train from Toronto to St. Mary’s, southwest of Stratford, and Michelle (and often her boyfriend Fred) would pick us up and drive us the final leg of the journey to Exeter. There, we would bunk in Michelle’s cozy apartment, spreading clothes and makeup around the place. We would take hours to “get ready” before going out and, when we finally did, would leave behind a cloud of cigarette smoke, perfume, hair spray and nail polish fumes. They were great times, and gave us many great summer memories. And now, as I type this, pausing to look out the window at a beautiful sunny, blue-sky-ed Friday, the first official long weekend (I’m off Monday June 30th) of another summer beckons. I’m deliciously anticipating a few days of relaxing with cold beverages, maybe some good movies, a great book, and the odd nap. In between, I will be thinking about summers past, and the good friends I’ve been lucky to share them with. Happy Canada Day to you all. I suspect most people have what you might call a “go-to” TV show. This would be a program that you watch in re-runs, buy as a boxed set, and even forsake date night for. Why? Because in some way, you identify with it on a deeper level. Somehow, the combination of characters, storyline, dialogue, setting and even music come together to hit a cerebral sweet spot. Such is the case with a quirky British series that, alas, was on for a brief three seasons a few years back but which I recently rediscovered on YouTube — reminding me once again why I love it so much. It’s called Jam & Jerusalem. Eventually, due to a change in family circumstances, Sal gives in. And so, over 19 episodes, we come to know a motley, lovable crew of characters. There’s Rosie (played by the one-and-only Dawn French), who has a split personality, the two halves of which (her alter-ego is the nasty Margaret) are often seen verbally duking it out. As an aside, Rosie works in the local cheese factory, and frequently pulls from a coat pocket or rucksack a slab of cheese (“for goodness”) which appears to serve equally well as snack, peace offering and hostess gift. Then there’s Kate, the rather whiny grievance counselor who cries at the mere mention of her late husband (he died five years previously) and can’t make a decision to save her life. Eileen, the highly flappable guild chair, sheds some light on the show’s name when she tells Sal that the guild is “not all jam and Jerusalem”. Probably fearing that such a title was too odd and English for a North American audience, the show’s producers marketed it here as Clatterford. It goes without saying that the writing on the show is bloody brilliant. The woman behind it is the incomparable Jennifer Saunders; she also plays a character in the show — and here’s a bit of trivia: her daughter on the show is her real daughter. You might also know Saunders from her role as the wacky, champagne-guzzling Edina (“Sweetie!”) in Absolutely Fabulous. Interestingly, Saunders moved with her husband and family to a 400-year-old farmhouse in Devon in 2001, a few years before Jam & Jerusalem aired. No doubt her characters and storylines drew from a great deal of personal experience. 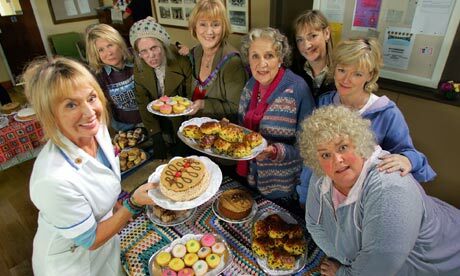 Which brings me to why I love the show — among all the other British shows I love, and there are many. What, I ask myself, is it a bout this one that really stands out for me? Gorgeous setting? Check. Eclectic characters? Check. Great dialogue. Check. Wonderful music (by the sweet-voiced Kate Rusby)? Check. But it’s more than that. I want to live in Clatterford. I want those people for neighbours. I want to drink in that pub (that’s not really a gauge — I like drinking in most pubs, though the Fountain is an especially lovely spot). And most of all, I want to join the guild. With that perfect balance of comedy and drama that the Brits do so well — always keeping it real and never rubbing your nose in it — Jam and Jerusalem whisks me away to a kinder, gentler place that, for me, is the perfect (gin and) tonic for whatever ails me. PS: Since starting on this post, I’ve sadly discovered that BBC WorldWide on YouTube has nixed all freely available Jam & Jerusalem uploads. I’ve nosed around BBC WorldWide a bit and haven’t found them there — if you manage to find them, please post a comment and let me know!